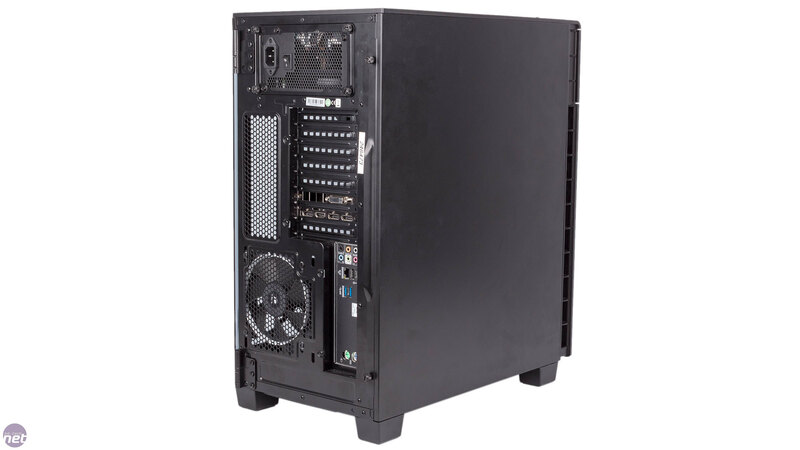 The Hyper Liquid range of systems from CyberPowerPC represents the company's most enthusiast-grade pre-built offerings. A range of configurations are available, with prices starting at just over £1,000 and ending at a whopping £8,000, although users are free to customise them as they see fit so these prices aren't fixed. 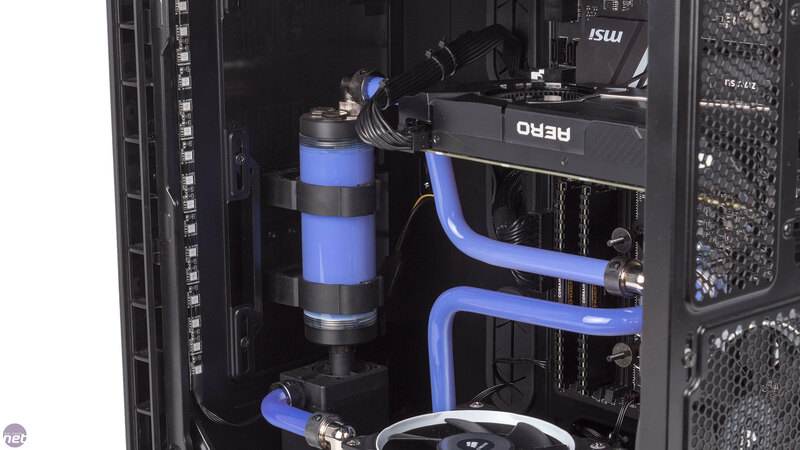 The common link, as the family name suggests, is that each of them is water-cooled by a fully custom loop using rigid tubing and users are also able to customise this, or at least the colour of it. In for review today is the Hyper Liquid 600, featuring an overclocked Core i7-6700K and a GTX 1070. 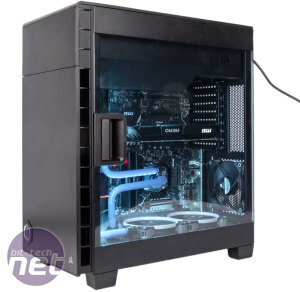 CyberPowerPC gets off to a good start by presenting the Hyper Liquid 600 in the Corsair Carbide 600C chassis, one of the company's better cases in recent years with clean, modern looks and an inverted layout that shows off your gear well through the side window panel. There are plenty of USB ports on the front panel too and a door that neatly hides the ODD bays, although these aren't used in this system. 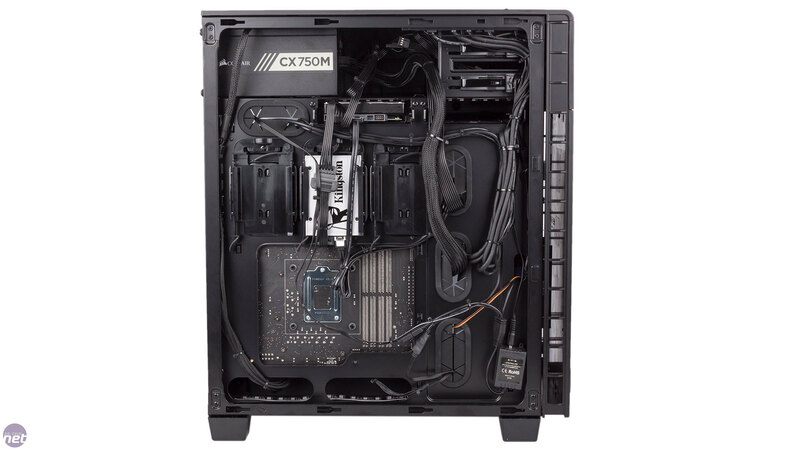 The motherboard is the MSI Z170A SLI. 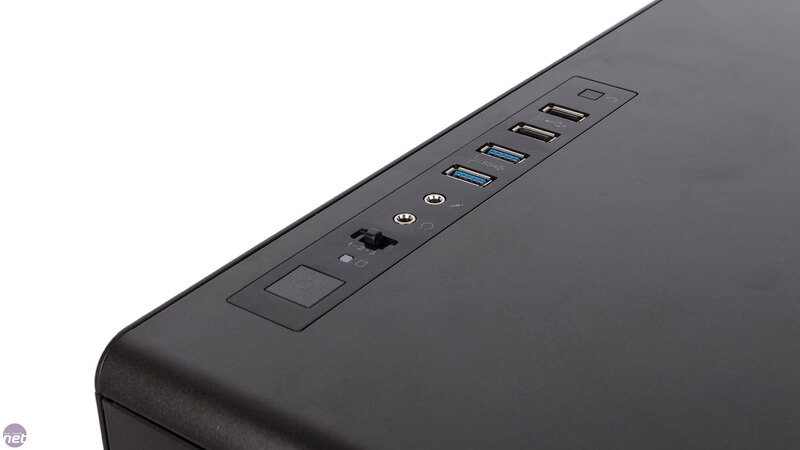 The first thing we noted is that the rear USB count is lacking relative to what we're used to – two USB 2.0 and two USB 3.0 only, although you do at least get USB 3.1 support in the form of the nifty Type-C connector. 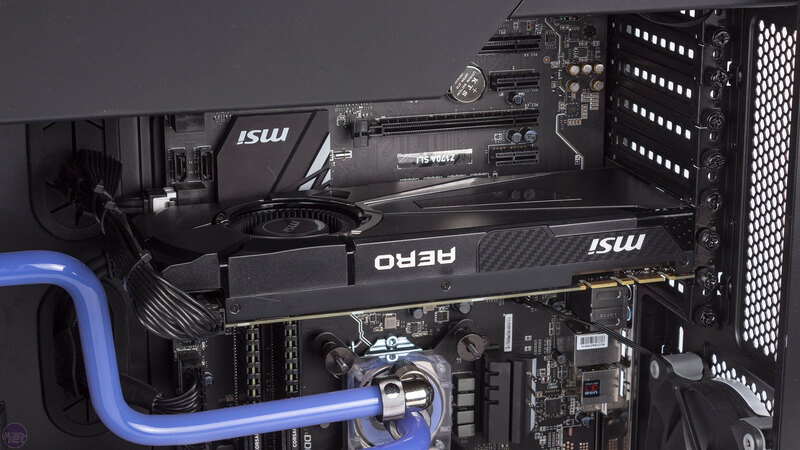 The board itself has an all black colour scheme and as the name gives away it also supports SLI, giving you a potential future upgrade path. 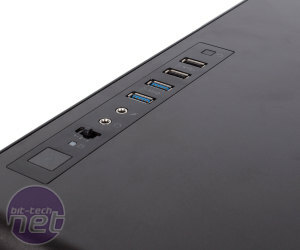 You could also choose to add in an M.2 PCI-E SSD, as the 2280 slot onboard is empty here. The flagship Z170 CPU, the Core i7-6700K, is used, giving you as much grunt as possible for the chosen platform. That said, the additional threads courtesy of Intel's Hyper-Threading technology aren't really beneficial in games, so swapping to the Core i5-6600K to save some cash may be worthwhile if you're not going to be running many heavily threaded applications. What will be beneficial is the pre-applied overclock, which in our system is 4.5GHz, hit using a vcore of 1.365V. Pleasingly, CyberPowerPC had saved both stock and overclocked BIOS profiles to the motherboard. Corsair Vengeance LPX DDR4 seems to be used in almost every system we get in these days. 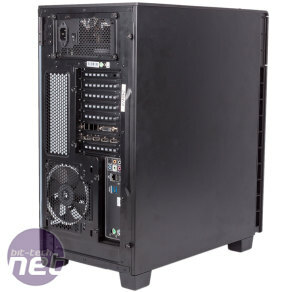 Specifically, CyberPowerPC has chosen an 8GB (2 x 4GB) 3,000MHz kit. 16GB has become something of the norm these days, but isn't necessarily beneficial in many applications. Still, it's easy to swap to a 16GB kt in the online configurator. The black heatspreaders on the kit used here match the motherboard nicely. The GTX 1070 is a fine choice for a high-end gaming rig, offering excellent frame rates at 1440p and even handling 4K pretty well as well as being suitable for VR. 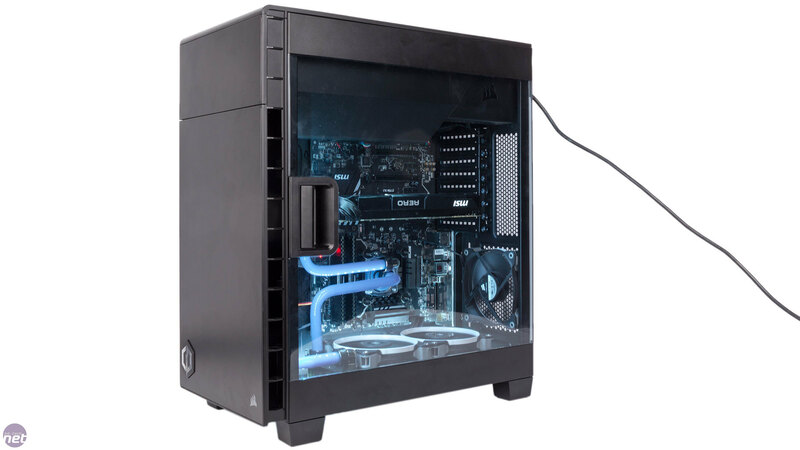 The MSI model CyberPowerPC has used unfortunately only uses a reference style blower cooler, which doesn't look especially premium and is likely to be louder than the majority of custom-cooled cards on the market, and this seems at odds with the idea of using water-cooling in the system. 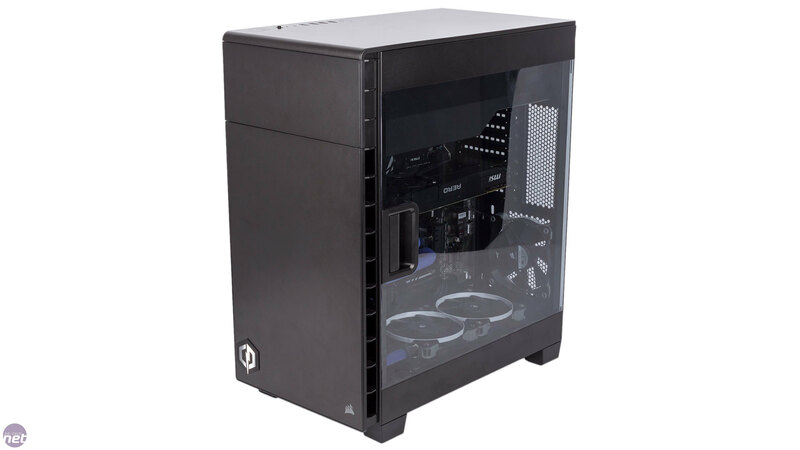 It does at least keep the price relatively low for this component, and it again matches the all-black colour scheme of the other components. 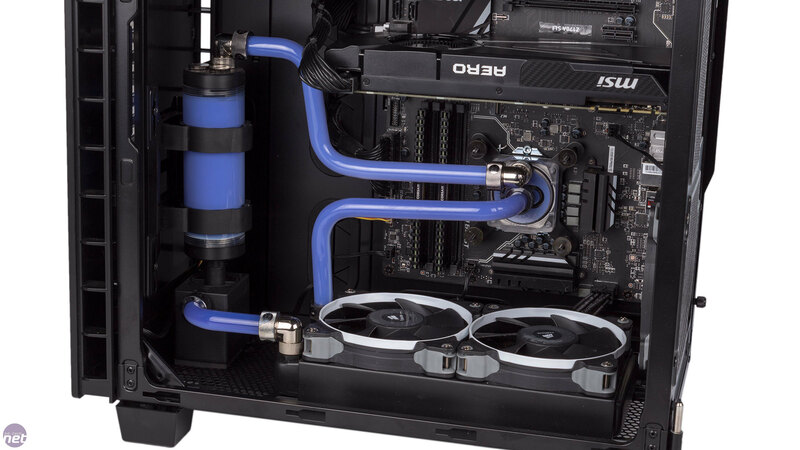 You're also able to select the MSI Sea Hawk EK X version of the card in the configurator should you wish to have the GPU incorporated into the water-cooling loop. 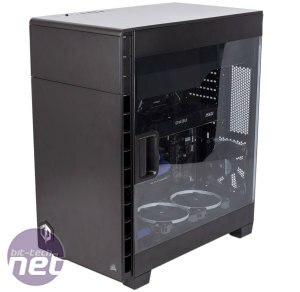 A 750W power supply, specifically the Corsair CX750M, is plenty for this single GPU system. 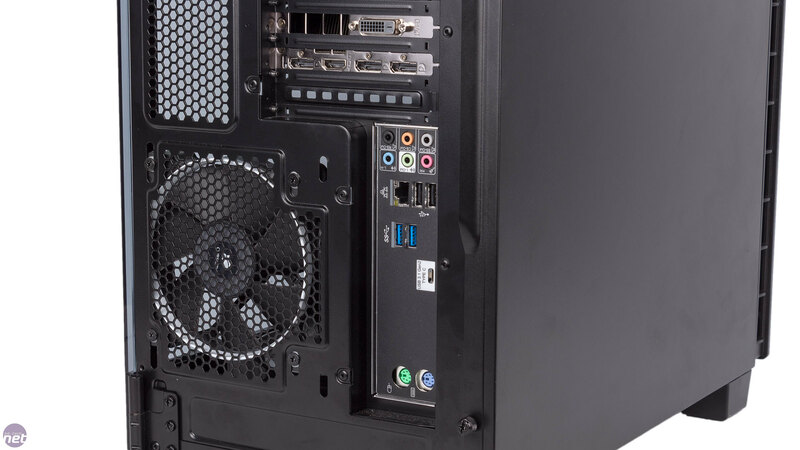 In fact, it will only need about 50 percent of this wattage to run the system at full load, and this can be seen as a good thing as it's when PSUs are at their most efficient and it will help to keep noise down. 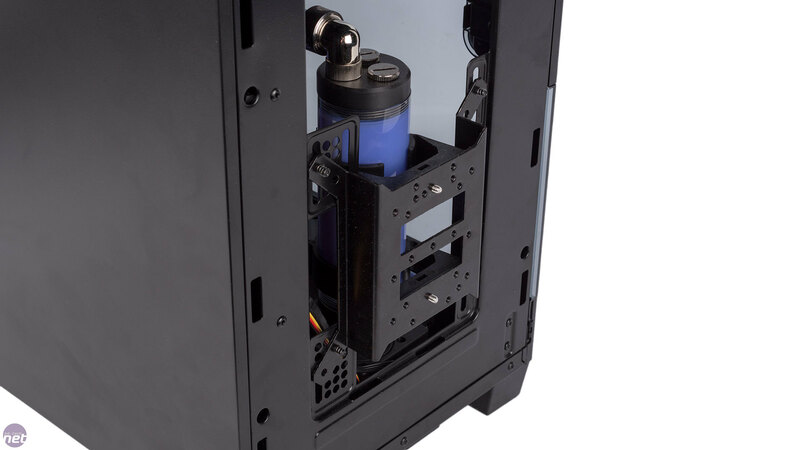 There's also enough headroom to upgrade to an SLI configuration should you wish. If not, you can always safely select a lower wattage model to save some money - again, the option is readily available. A 240GB SATA 6Gbps Kingston SSD and a 1TB HDD make up the system's storage – a very safe selection that balances cost, capacity and speed neatly and you can of course customise this setup as you see fit. In a normal system, the all-black colour scheme would be boring. 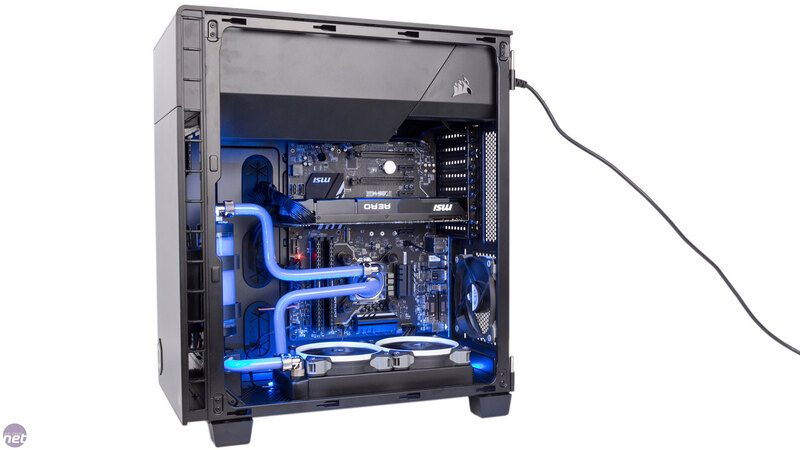 In the Hyper Liquid 600, however, you get a Deepcool RGB lighting system pre-installed. Comprising three RGB strips – a vertical one at the front near the window, one on the floor just behind the radiator and one in the roof section – this lets you set the rig lighting to any colour you like using the supplied touch-sensitive remote. The strips are synchronised, not independently lit, and you can set them to a variety of flashing and colour changing effects with control of the brightness and speed also offered. The effect is pleasant and really adds impact to the build, and it's good that the strips themselves are well hidden from view. 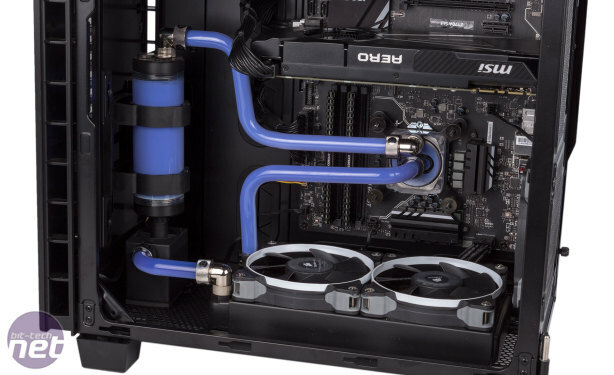 One other thing to note aesthetically speaking is that the white rings on the three Corsair fans can be swapped out to red or blue ones as these too are provided. 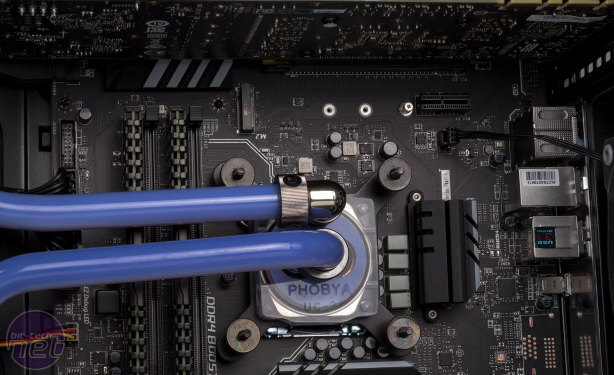 The water-cooling loop uses a single copper radiator, the Alphacool Nexxxos ST30, with the CPU itself cooled by the Phobya UC-2 water block. 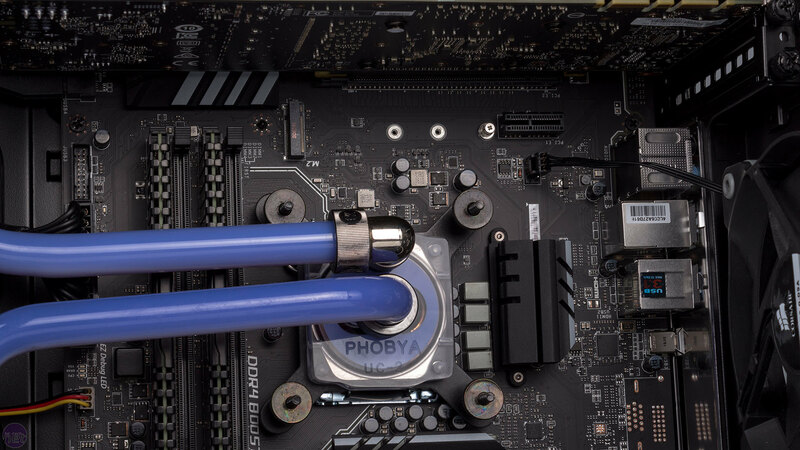 There's also a radiator, specifically the Alphacool Cape Corp Coolplex Pro 15 LT, and the pump used is the Phobya DC12-260. 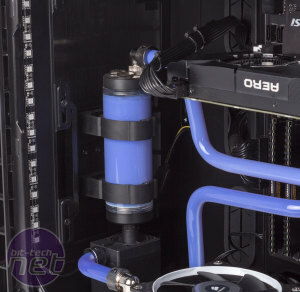 It's a simple loop, but it looks great thanks to CyberPowerPC first taking the time to use hardline acrylic tubing and also filling the loop with coloured Mayhems coolant – in this instance blue, but many options are available. 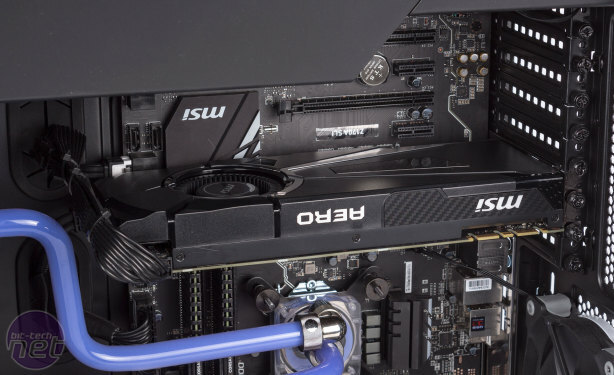 The two main Corsair SP120 fans are attached to the CPU fan headers, and although a PWM profile is set for these their 3-pin connection doesn't allow them to use it so they're instead fixed at full speed – thankfully, they are at least the Quiet Edition fans rated at a maximum 1,450 RPM. 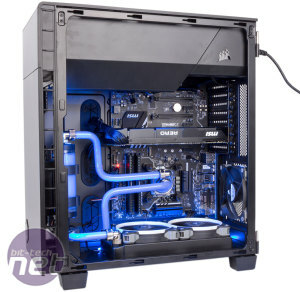 The third fan is connected to a system fan header and set to 60 percent speed. 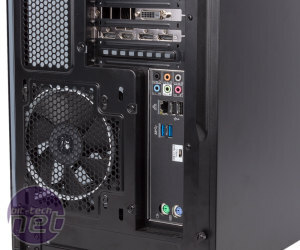 We think it's a shame CyberPowerPC didn't use the case's onboard fan controller (although it has at least connected the power cable for it) to give users a choice between low noise and high performance that doesn't require delving into the BIOS. 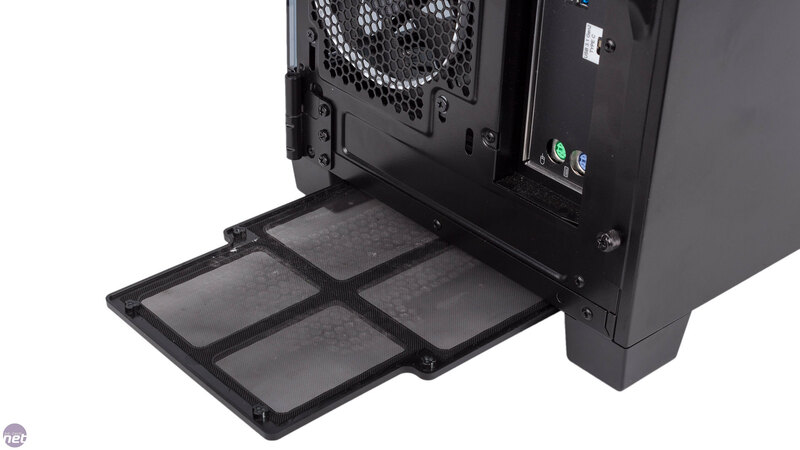 The cooling system is also questionable from a dust perspective. The rear fan operates as an intake and there's no dust filter for it while the two attached to the radiator face downwards and exhaust air. 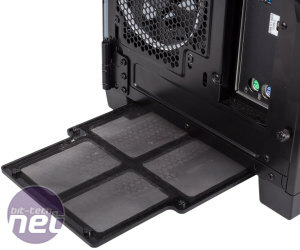 A dust filter is fitted to the bottom of the chassis however, and this potentially creates a situation where dust will be sucked in and largely trapped by the filter – far from ideal. What's more, the dual exhaust/single intake system will create negative pressure (especially as the exhausts spin faster), potentially drawing even more dust in through the gaps at the front, where the dust filter has had to be removed to make way for the radiator. We're only speaking theoretically here, as we don't have time to test the system long-term, but it does seem prone to dust build-up to our eyes. 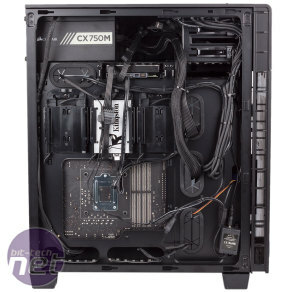 CyberPowerPC has done a fine job routing all the cables in this system – the main cavity visible through the window is extremely tidy and we've no complaints in this regard. The standard warranty is three years, although only one month of this covers collect and return services – a £19 upgrade to extend this to one year is available, as are other more extensive (and expensive) options.